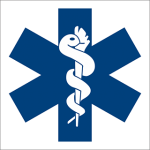 You will learn: This course will give you the skills and knowledge required to provide first aid response and emergency life support to a casualty in a remote and/or isolated situation. This training is suitable for workers who may be required to prepare for and provide a first aid response in locations beyond the reach of timely medical assistance. 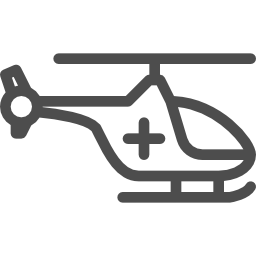 Stretchers, manual lifting and evacuation of casualties and more! Once booked you will receive an email with a link to Allens Training (the RTO we partner with). Simply complete the learning module (approx 15 minutes), print* it out and bring your proof of completion certificate to the course. 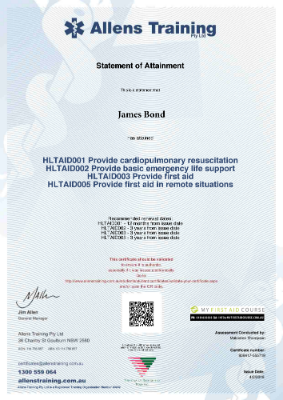 HLTAID005 Provide First Aid in remote situations, students will receive a certificate that is valid for 3 years from the course completion date. If a hard copy of the certificate is required, this needs to be requested in advance. An extra $5 will be added for this. Please note hard copies will take between up to 30 business days to arrive based on Australia post). * 6 hours hands-on training. Have fun. Perform at least 2 min CPR on a CPR manikin placed on the floor.